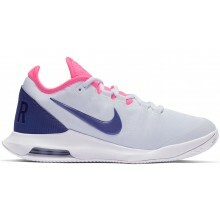 Discover a large range of women's Nike tennis shoes on Tennispro.eu. Many players have chosen this brand, particularly Serena Williams, Simona Halep and Maria Sharapova. Other players who cannot resist the checkmark brand are Caroline Garcia, Elina Svitolina and Madison Keys. It is extremely important to choose the correct tennis shoes for modern players. It has become mandatory to choose high quality tennis shoes. Nike offers excellent models that unite style with quality. The models will bring support, light weight, comfort and energy. Nike shoes are available in clay, hard court and carpet soles in order to enable you to play on many different surfaces. The most famous women's Nike tennis shoes are the Air Zoom Vapor X or Vapor 10. This shoe is the version that follows the Air Zoom Vapor 9.5. These models, worn by Caroline Garcia or Elina Svitolina, are extremely dynamic and are ideal for quick players. If you are a physical player and you are looking for stability and support, choose the women's Nike Air Zoom Cage 3 shoes or the women's Nike Flare shoes worn by Serena Williams and Victoria Azarenka. For the players who have an intermediate level and are looking for excellent value, Tennispro.eu has the shoes for you; such as the Nike Air Zoom Resistance and the Nike Air Zoom Prestige as they are resistant and stable. Other models created by the famous American brand are the Nike Air Zoom Ultra and the Nike Vapor Advantage. Technological innovation is at the core of the Nike company in order to offer the best shoes. The most commonly known technology within Nike shoes is the Zoom Air, which permits heel cushioning and exceptional support. The Dynamic Fit and Flywire systems contribute an optimal lacing mecanism. Lastly, these shoes, such as the Cage model, possesses Nike Drag-On material in order to provide a medial part of the shoe that resists sliding.